That simple but impactful statement might have sealed the deal. When Davison accepted Legans’ offer to become a member of the Eastern Washington Eagles, the student-athlete’s wording was perfect. Davison, a sophomore who is his team’s leading scorer and one of the best players in the Big Sky Conference, says becoming an Eagle Scout has helped him become a better basketball player and person. The road to becoming an Eagle Scout wasn’t always easy for Davison, who grew up in Long Beach, Calif. He was active in Scouting in middle school and during his freshman year of high school. He remembers earning the Wilderness Survival merit badge — his favorite one — at Camp Tahquitz in the San Bernardino Mountains. He loved snorkeling at Camp Emerald Bay and taking a 15-mile backpacking trip on Catalina Island. As a high school sophomore, Davison decided to drop out of Scouting to focus on basketball full-time. About a year later, he had a frank conversation with his father. “I talked to my dad about it, and my dad was telling me that I need to finish, because it’s such a huge accomplishment and I’m so close,” Davison says. After basketball season ended his junior year, Davison and his dad looked into how much work remained for him to become an Eagle Scout. With that little push from his dad, who regretted not staying in Scouting longer in his own youth, Davison got to work. After talking to his coach, he scheduled Scouting around practices and games — attending as many meetings, campouts and service projects as he could. For his Eagle Scout service project, Davison built six planter boxes and a toolshed at a middle school in Los Angeles. Today, the school still uses those planter boxes to grow food for the cafeteria. Davison became an Eagle Scout on March 25, 2015, as a member of Troop 66 of the Long Beach Area Council. He has a message for his fellow athletes who are juggling Scouting and sports. The Eagle Scout award stays with you for life. It’s a permanent part of who you are. 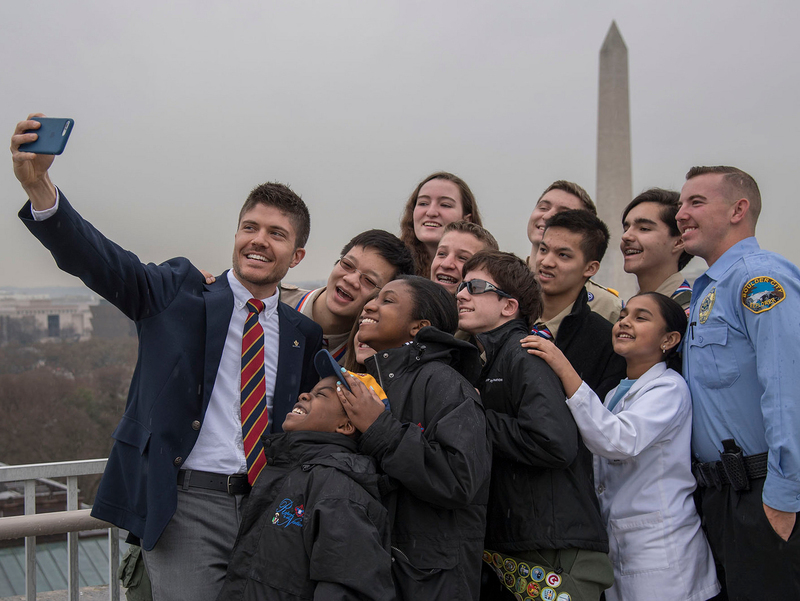 After his senior year in high school, Davison wanted an outwardly permanent way to honor the journey toward Scouting’s highest honor. He got a BSA fleur-de-lis tattoo on the tricep of his left arm. Davison is recovering from an ankle injury but should be healthy enough for the Big Sky Conference tournament, beginning March 13 in Boise, Idaho. Early round games air on Eleven Sports, while the championship will be shown on the ESPN family of networks. The Big Sky champion will receive the conference’s automatic bid to the NCAA Tournament. I’ll say one thing: Davison’s fellow Eagle Scouts will be cheering him on. What’s better than Eagles rooting for the Eagle on the Eagles?